Mind if I look in your shopping cart? In addition to knowing your pop culture references, sometimes just plain, old spying on shoppers can sharpen your buying skills. I do it all the time when I am in the Goodwill Store or at garage sales. As people walk by me, I take a quick peak into their shopping cart to see what they are buying. My philosophy is this: If someone is buying it, then maybe other people want it too! It's really just a form of basic market research. Sometimes you can even spot a fellow eBay seller and see what they are buying at the thrift store or garage sale. You can usually pick them out...they're the one's holding something that just doesn't seem to fit their demographic. (Like me buying a Disney toy castle at a garage sale-see previous blog) eBay buyers also move quickly through racks, only stopping to look at an occasional clothes tag. If you spot a fellow eBayer, definitely look to see what's in their cart. Conversely, if you saw me at the thrift store you would have a hard time spotting what I am buying. I deliberately hold my "finds" down between my waist and the clothes rack. This makes it harder for my competition to see what I am buying. Am I being a little paranoid? Maybe, but hey, it's a "dog-eat-dog" world out there! Why should I show my hand to my competitors in the store? They can read about my finds later in this blog! Here is good example of some market research I did at a local Goodwill. I was going through the racks when I noticed two young college guys shopping over in the next aisle. I had already been through that same aisle earlier and hadn't found anything. (Or so I thought) I watched as one of the college guys pulled out a "Members Only" jacket from the rack. He tried it on, then asked his buddy how it looked. Apparently it didn't fit and the kid hung the jacket back on the rack. It was at this point that I remembered "Members Only" jackets were kind of a big deal with the college crowd. After the boys moved on, I went right over to the rack and retrieved the jacket. It was in very nice condition and priced at $4.99. I figured if these college guys took the time to try it on, there would be interest from other college kids too, so I bought it. Members Only jackets have the potential to do very well on eBay, especially if it's the right color. Look for unusual colors such as red, black or white. My jacket was a light brown color that looked like leather, which I thought would be a good selling point. I posted the jacket right away on eBay, eager to see if my Goodwill market research was on target. Well, the boys did right by me! After a seven day auction my Members Only jacket sold for $25... a nice 20 dollar profit! While other Members Only jackets may have seen even higher prices, I was happy with a twenty dollar bill in my pocket. If it hadn't been for those college kids, I wouldn't have even made this sale. It pays to watch people shop! You don't always have to be an "expert" when looking for stuff to sell on eBay. Sure, there are some serious antiques, glassware and fine art collectors who scour auctions and estate sales searching for the big find. I am not at that level, but sometimes it's enough to be up on pop culture. I call it having your "radar" up. When your pop culture radar is up you can come across some decent finds. Check out this crazy looking duck telephone. Does it look familiar to you? If it doesn't let me congratulate you, that means you've never watched MTV's "Jersey Shore". I don't really watch it either, but I caught it a few times while channel surfing. I noticed they have a duck phone in their party house that looks a lot like the one seen here. I found this one at the Goodwill Store and paid only two dollars for it. Since the show is so popular, I thought it was worth a shot. So I listed it on eBay using "MTV Jersey Shore" in the title. My description enthusiastically claimed the phone was just like the one used by Snookie and the Situation. The kids out there must have liked my description....my duck phone sold for $31 dollars! A decent profit on an eight quarter investment. If it were not for the popularity of the show, this dumb duck phone would have never seen a selling price that high. So do you need to be an expert in antique collectibles? Nope, sometimes you just need to watch the latest hit shows on television. This yard sale season keep your radar up. You may find some pop culture stuff that will make you some nice dollars! I love when I can take something that I received for free and turn it into a nice little profit. Just because something is free doesn't mean it's not valuable to someone out there. It's all about availability. If collector's can't acquire it easily, even if it's free, then they will be more then willing to pay for it. 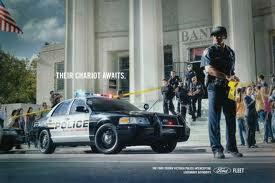 Take the Ford Crown Victoria Police poster seen here. Ford prints these every year to promote their police cars and hands them out for free at some car shows. I usually acquire a few every year. The first one I acquired went back almost ten years. I thought it was cool so I tacked it up in my garage where it collected dust. About a year ago while cleaning the garage, I looked up at the poster. It was hung high on the wall so it wouldn't get ruined. But despite it being posted up high, I knew it would never survive a lifetime in the little shop of horrors called my garage. Somehow, some way, I would eventually put a rip in the poster with my ladder, spill paint on it or some other disaster. So I decided to go the eBay route. The poster was from a few years back, but was still in good condition. I gently took it down, dusted it off and took some photos. Once on Ebay, I learned quickly that collectors were interested in the old poster. I watched in amazement as it clicked up progressively during it’s run. On it's final day, the dusty poster topped out at $75! Not bad for something that hung in my garage for years! In a tale of two posters, my brother had been with me at the same car show and picked up the exact same poster. So after my auction, I naturally bragged to him how I pocketed a quick $75 from it's sale. My brother was bummed out from the news..... he had recently torn his poster off the wall and trashed it! He basically threw away $75 ! But let's face it, if everyone kept the poster and sold it on eBay, I wouldn't have been able to sell mine for $75. It's the old supply and demand story! Not every Ford poster returns that kind of profit, obviously the older the better. The current one seen in the picture sells for around ten bucks or more. But if you hold onto them, they only go up in price! So just because you got it for free doesn't mean you can't make a few bucks from it! What's hanging on your walls? Mysteries of the Goodwill Store. Not long ago, I found a Lenox porcelain statue from their "Garden Bird" bird series. The price was only five dollars. It was made of fine porcelain and depicted an American Robin perched above her nest. (If you want to see it, I posted a picture on my Twitter page.) This Lenox piece was still in the original box! I pulled the robin out of it's box and ran my finger all over feeling for chips. I was convinced I would find a flaw someplace, why else would it be marked for only five bucks in Goodwill? After careful examination there were no chips to be found. The thing was perfect! Fast forward to my eBay auction and boom.....sold it for $26 dollars! Goodwill and Lenox-who would have thunked it? On another trip to Goodwill, I came across an official Nike "Team USA" hockey Jersey for a mere five dollars. It was brand new with all the tags attached. This was a "perfect storm" Goodwill find. With both the Christmas shopping season and the Winter Olympics just a few months away, I knew this would sell for a nice price. I scooped it up and posted it for Christmas shoppers. The selling price was very nice....it sold for an incredible $76 dollars! After happily counting my profits, I wondered how a brand new Olympic hockey jersey ended up in the Goodwill Store just before the Olympics? I guess I'll never know, but I was glad I found it! 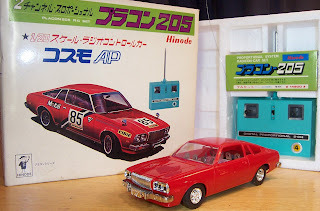 Lastly, one of my more stranger finds at Goodwill was the Japanese radio-controlled car seen above. This was found new in the box, with the hand controller still wrapped in the original plastic. The outside of the box had all Japanese print, obviously it was meant for sale in the Japan. Stranger still, even though the toy looked brand new it was actually from the 1980s! You have to wonder where this toy was hiding for the last 25 years? Did Marty McFly bring it "Back to the future" in his Delorean? Was it lost in a warehouse for a quarter of a century? How the heck did it survive all these years, ending up on a shelf in my local Goodwill store? Another unexplained Goodwill mystery! 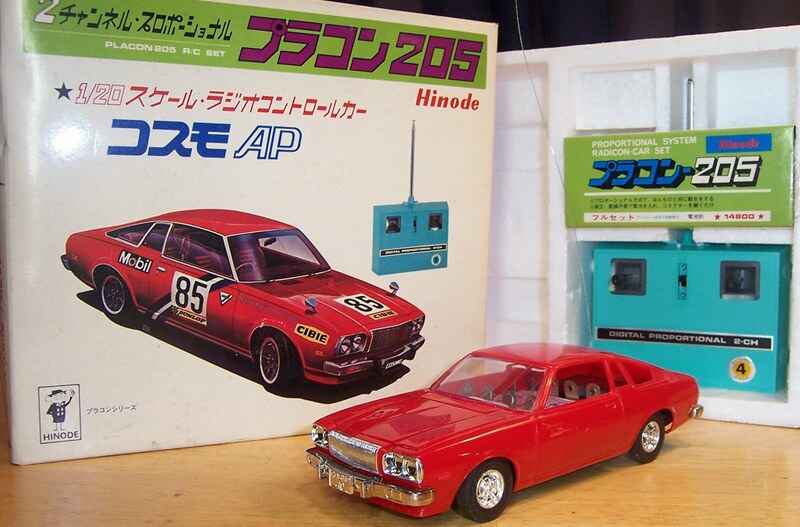 While I couldn't explain it's Goodwill lineage, I did know radio control cars can be hot sellers on eBay. So I barley hesitated at the price tag of twenty dollars. While it was a little more then I am use to spending, I had a good feeling about this toy. When I posted it for auction I saw my hunch pay off. The closing price was a whopping $88 dollars. This little red car netted me a profit of $68...not too shabby! Like I said, you have to trip over a few George Foreman grills, old VCRs, and tacky shirts while shopping at Goodwill. But amongst all that junk can be little nuggets of gold! Just like the old time gold prospectors, you have to put the time in to find the gold. The three finds above grossed over $150 dollars for me...not a bad little gold nugget! So get yourself to your local Goodwill store and discover it's merchandise and mysteries! Don't let the color fool you! Doing my usual Saturday morning rounds last year, I came across a garage sale not advertised in the local paper or Craigslist. I always approach these spontaneous yard sales with added interest. Garage sales that are not publicized in the paper or Internet mean fewer buyers and more good stuff for you! As I walked up the driveway of this sale, the seller was busy pulling stuff out of moving boxes. Shipping paper was everywhere as she worked her way through about a dozen or so boxes. She told me she had recently helped a friend move and the boxes were leftover stuff intended for the Salvation Army. But instead of taking them to the thrift store, the seller asked her friend if she could have the boxes for her garage sale. Her friend agreed, sort of as payment for all her hard work. She had an assortment of so-so stuff, but when she pulled out this powder blue camping lamp from a box, I took notice immediately. As discussed in previous blogs, camping gear like Coleman sells well on eBay. This powder blue lamp looked exactly like a vintage Coleman lamp, but had a Sears decal on the front. Looking it over, I could see the lantern was uber-clean and in excellent condition. I asked the seller what she wanted for it and she threw me a price of three dollars. I thought about for a minute, debating in my head if this thing was some kind of cheap, Sear's knock-off. Since Coleman is king in camping, I also wondered if anyone would be interested in a Sears camping lantern? After a little more self-doubt, I decided a three buck investment was well worth the risk. I brought home the powder-puff blue lantern and took a bunch of photos showing it's clean, near-new condition. I also learned that it actually was a Coleman lantern made exclusively for Sears. The Coleman company basically painted it blue to distinguish it from their more famous forest green color. So I was happy I had a Coleman, but still not sure if collectors would be interested. Let's face it, you don't normally associate the color of powder-puff blue with camping in the great outdoors! Despite all my misgivings, I posted my three dollar find on eBay. Shortly thereafter, I began receiving international inquiries, asking if I would ship overseas? My auctions usually state domestic only, but with all the foreign inquiries I decided to open up the auction to overseas bidders. At that point the flood gates opened and bidding blew up! The powder blue lamp started climbing....thirty, forty, fifty dollars. Curious, I typed in Sears vintage camping lanterns and found a handful of them listed. The completed auctions were seeing nice prices with most of the buyers from Japan. Apparently, the Japanese have a thing for powder blue camping gear! The lantern continued to climb and things got interesting. On the final day it was north of $150. In the final minutes of the auction the bids blasted passed the $200 mark and closed at.....wait for it... an incredible $221 dollars! And the buyer was from where? Japan, of course! Looking back, I have laugh to myself. I actually stood in the seller's driveway and wondered if eBay buyers would be interested in an odd looking powder-puff blue camping lantern! Fortunately, I went with my gut and it paid off nicely. So if you see power-puff blue, it could really mean green $$$ for you!